Obsolete: The site has been down hard for a couple of years. The Stack Exchange Elections Statistics Page is a simple single-page website that displays information on election candidates participating in the Stack Exchange 2011 Moderator Elections. It pulls together information normally found in each candidate's profile as well as their Meta and SE-wide participation information into one single handy site, presenting the information neatly and efficiently, allowing you, the voter, to make the most informed decision possible. Community members have also been going round posting links to this on each of the site's Meta, so watch out for those too. Should work reasonably well on all modern browsers (IE. not Internet Explorer, though you're welcome to try). Please post bug reports and feature requests (more suggestions on what stats to display always welcome!) here. You can usually find me in the Meta Tavern if you want to talk. The idea was brought up originally by Benjol on Meta Stack Exchange. This page is written entirely with front-end web development technology. jQuery is the backbone, and the jQuery template plugin is used extensively. Snippets from James Padolsey are used for sorting stuff, and timeago is used for relative time. It doesn't currently seem to recognise Gaming's new election correctly. It doesn't show up as an active election, but the Gaming option in the "Completed Elections" section actually does load the current election so it's sort of working - it makes it hard to find, and also means we can't access the previous election any more (at least, I can't find it). status-completed Could we please have support for adding the "Deputy" badge in the noteworthy badges list? It doesn't seem to be recognised when I try to add it. status-obsolete I don't know if the API exposes it, but showing a user's flag weight along with their other stats could be a nice addition. Would probably be useful to expand the notable badges to include the new Review badges (Steward, Reviewer, Custodian)! Also number of flags approved and number of delete votes that have been cast if possible. I propose that these be called out as 'required' badges for the SO election, and that 'Deputy' be added to the 'Noteworthy' list for other elections. This was also requested by DMA. It would be nice to see one's own or another user's profile analyzed in this manner. It could be used like a "Should I bother running?" self-check. Obviously there would be no candidate text shown for people who have not come forth but but I like the extra bit of data aggregation that seems like a supplement to the profile page... And even if you don't plan on running you could see how valuable your participation is to the community and where there may be more room for improvement for better participation. The page seems to be breaking in Chrome for the stack overflow nominations with the following message "Uncaught TypeError: Cannot read property 'length' of undefined". It stops working after the step "Loading User Profile on main site". The result of this is a list of user ids containing "NaN". 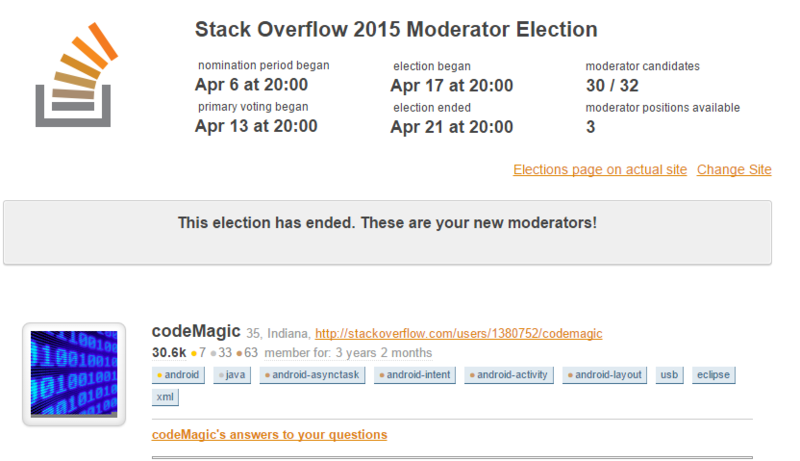 See the most recent Stack Overflow election, for example. It says, "These are your new moderators", but... who are they exactly? The "Noteworthy Badges" section appears to have a bug on the wordpress.stackexchange Moderator Candidate Statistics page. It may effect other elections as well, but I am not sure. Tom J. Nowell, Kaiser, and myself all have the "Strunk and White" badge but the badge is marked red on the elections page. Add a filter to include only candidates who are in the final election, once the primaries are finished. Update: Fixed (GitHub pull request) and deployed. Thanks, Tim Stone! The link in the footer also has this problem. Please add security.SE to the list. Add Bicycles to the list. Update: Done. Please add Christianity to the list, elections there are already in primaries! See also MSO bug report here. Update the list of Noteworthy Badges so that it includes all the badges that the Candidate Score uses for tabulating the score. 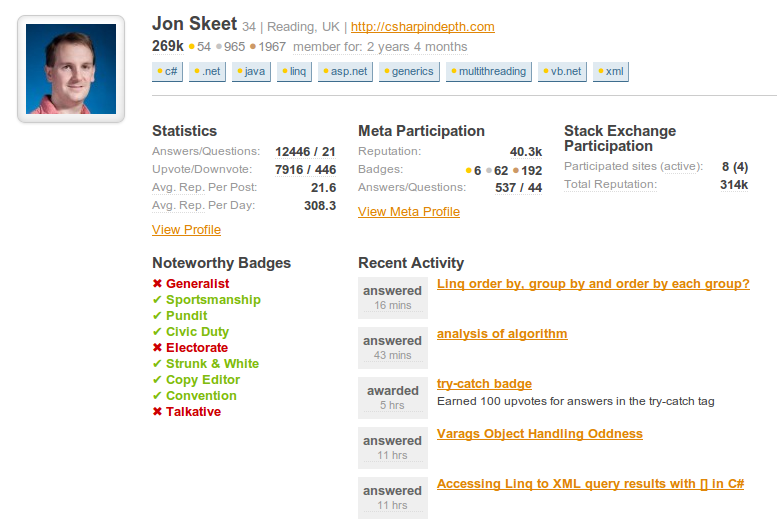 This will then make it easier to see the specific gaps in their badge earning, and therefore activity on the site. Please support badges in other languages. In the recent election on Russian SO, it looks like nobody has any of the badges. However, that is not strictly true. Indeed, they do not have the Deputy badge, but they do have the Участковый badge, so Deputy should be marked. Could you please also display the candidate score and add a Sort by: candidate score button? Programmers has moved to Software Engineering. The icon on the main page still uses https://cdn.sstatic.net/programmers/img/favicon.ico, but it should be https://cdn.sstatic.net/Sites/softwareengineering/img/favicon.ico. Since the old link no longer exists, we get "Programmers logo" instead. bug The site is down hard! The Q&A site elections.stackexchange.com doesn't seem to exist…yet. Would it be possible to tabulate this data and sort on columns? It's very useful but a little slow to find the right candidate. I'd especially like to sort on the ratio of up/down votes, edits and close/delete requests. Network rep total calculation seems to be incorrect. For example, it's currently showing my total as 13.3k when the flair calculation (that includes sites >200 rep) says 15k and the total including all sites is higher than that. I'm not upset, I'm just filing it as a bug report. Not the answer you're looking for? Browse other questions tagged app obsolete website elections .